Location: Empty your mind. Be formless, shapeless. Like water. My mate has just bought an automatic one of these. God what a horrible little sh*tbox it is. Your decision at the end of the day, but as the poster above me states, there are much better cars available for the same money. the only good one i've been in was a 4x4 Starlet Turbo, it stuck to the road like no ones business and looked like your grannies daily runaround. Yeah, and I know another guy that spends loads of money on his. Constantly telling me it's gonna have 240bhp when he turns the boost up etc etc, and how amazing it's going to be. At least if I spend money modifying my Impreza, I know it will actually be good to drive, and genuinly pretty quick - whereas that will still be sh*t.
And really *IF* it really did have 240bhp how exactly do they put it down on the road? I think out of the box they are around 130bhp so thats a hefty jump in power! Last edited by Jamz3k; 05 January 2009 at 04:35 PM. You can get yourself a U.K Specced 2004/2005 Daihatsu YRV Turbo 130 for less with a 1.3 Litre Turbo engine and it is only Group 8 Insurance. I know I bought one as a run-a-bout, 'View My Scooby for piccies'. The Glanza was only made upto 1999 from what I can see. Last edited by jpor; 05 January 2009 at 07:07 PM. It's a bit of a mental beast!! Yep, the car weighs well under a ton, is moderately stripped out and has roll cage fitted. Has fully adjustable coilovers and with the LSD has massive grip and high cornering speed. I think the car was originally setup for short sprints, but having said that it had no problems hanging on the coat tails of some moderately tuned Evos. Last edited by jonc; 05 January 2009 at 08:53 PM. I have had one mate,my opinion on them is that they are a great little car,yes they are a 1.3 with a turbo! but theres nothing to them weight wise,770kg. and handling was on a par with my scoobie!,yes really in the dry that is,plus it did have teins(coilovers) lsd. fuel consumption was great too,you have a switch for adjustable boost hi/low,i was getting 40-45 to the gallon. Last edited by dannytwo; 05 January 2009 at 08:59 PM. I think they are superb little cars, my mrs has had a couple and they have been really reliable, economical and fast. Current one runs 170bhp, which doesn't sound a lot but with the weight it really flies. Nippy little buggers them - might be a small engine, but as they weigh slightly less than Kate Moss they can't half shift. Particularly at less licence-endangering speeds than larger, more powerful cars. A tuned up one of them would be more than capable of making a lot of machinery look a bit daft in a quick little sprint up to 80-ish - and once the bugger is in front he's already 'won'. Doesn't matter if you blow past him at 120mph or something - you both know that you got shown up. It's like racing vans - you'll gain nothing from a victory and complete humiliation from a loss. I avoid them despite having nearly 3 times the power of a standard one. I think they are great little cars. Yeah people will think they are expensive for what they are. They hold their price very well and are very cheap to run. Im on my 2nd Glanza. I bought it as an investment as it has all the rare optional Recaro and TRD extra's. 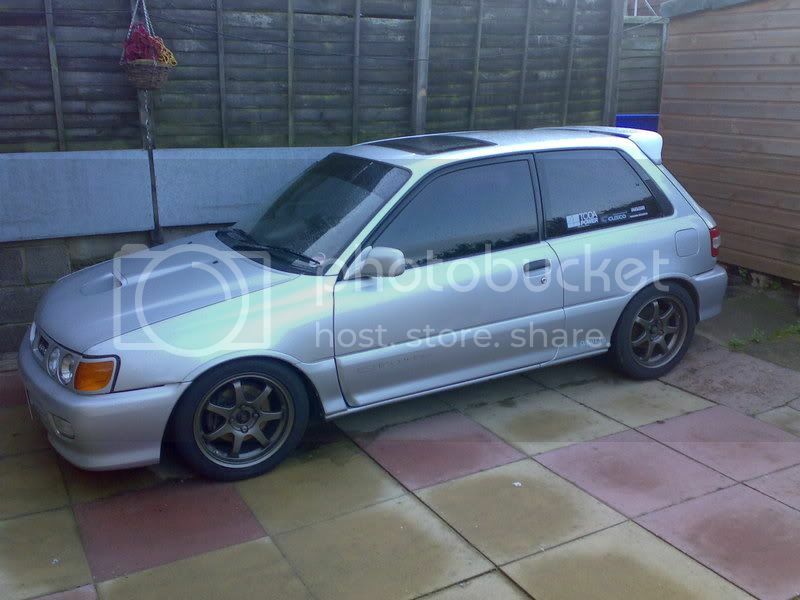 Mines is running 260bhp approx, using a TD04L turbo from an Impreza and a fully forged engine. Its manic and scares they **** out of much bigger cars. In the dry its easy enough to get the power down on the tarmac but in the wet its totally useless on boost. There are loads of tuning goodies, bolt on 300bhp kits for not much cash! Everything is cheap - £2500 for a fully forged rebuild, best of clutches for £200. List goes on! Easy car to work on too. Find More Posts by Herbie. Some of the parts are cheap because some of the quality is rubbish. I've been asked to fit stainless exhaust manifolds and decats to Starlet Turbos and they've been awful - thin flanges that aren't flat. Crap welding. I wasn't surprised when they all cracked within a few thousand miles. yeah thats true, id keep away from the cheap stainless stuff. It wont last two minutes. Mild steel ones are very tough though. I had a 172 and it was a piece of [email protected]@t. I'd go with the glanza myself. 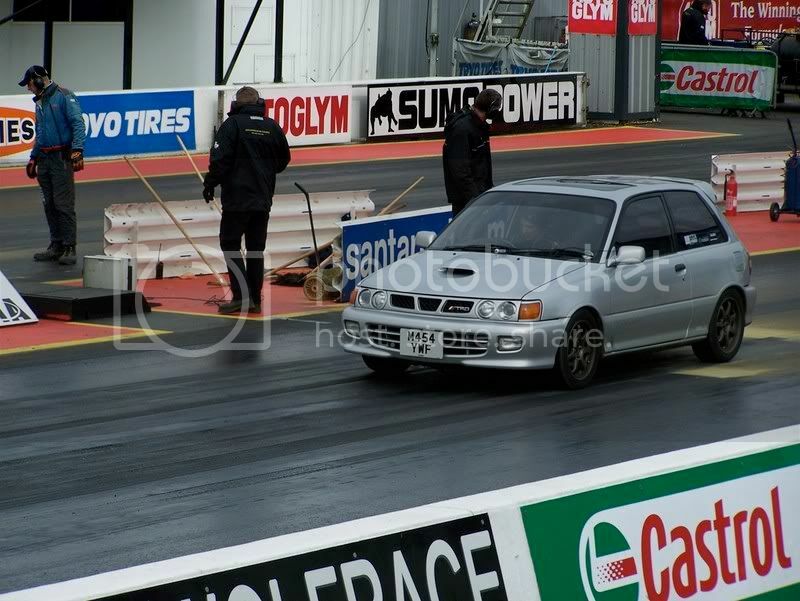 I had a fully forged Glanza last year..
286bhp was a absolue monster stripped out. in the dry it was awesome. had Toyo tyres on.. well worth the buy and fun.